WATCH [CC] - Ai-Media: Blake Culley - What it's like growing up Transgender and Deaf. Ai-Media channel on YouTube, share the video about being person as a Transgender and Deaf. The footage has gone viral on social media platform in LGBTQ community. Blake Culley, didn't realize they transgender for a long time because of inadequate access to information as a Deaf person. 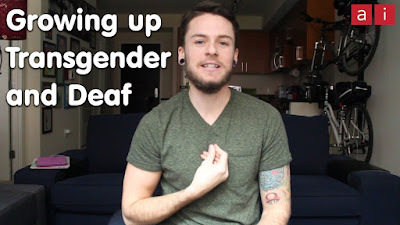 Now they're sharing their own story online so Deaf trans people know they're not alone. Blake's Instagram - @vlogsbyblake.